Do you every stop and think, “If only I had this…” or, “Once this happens, I’ll be happy”? A lot of us live in a state of discontent, always thinking about what could be, and what needs to happen in order for us to truly be happy. While it is heathy to have goals and aspirations, things can go off kilter when we become so lost in the future that we fail to enjoy the present. Wherever you are and whatever you are experiencing, you have the potential for happiness. That’s right, in your job, as you’re preparing dinner for the kids, even as you walk through deep emotional issues, you have the capacity to live a happier and healthier life. Being happier won’t solve all your problems, but it will help you through the present moment, and you will find the journey to your hopes and aspirations far more enjoyable. 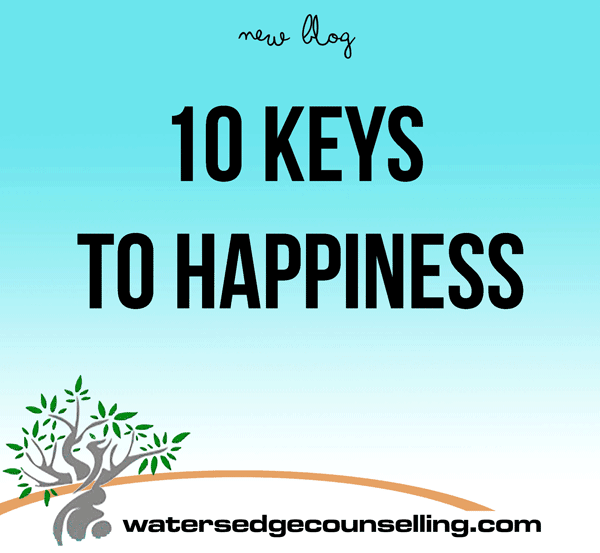 Here are 10 keys to happiness which you can implement in your life to benefit your own wellbeing. Begin to question anything negative you say to yourself. By investing in your own growth through ‘me time,’ meditation, personal development and counselling, you will uncover beautiful and unchartered territory in your own life. Instead of comparing yourself to colleagues, other parents, siblings or your spouse, remind yourself what you have to offer. Next time you think “I should be a better _____ “and compare yourself to some else, put your ego aside and remind yourself that who you are is enough. Worrying about the future won’t change its outcome, so instead make the conscious decision to enjoy the moment. Bring your thoughts back to your present circumstance, your family and what you are thankful for. Worrying about the future won’t change its outcome, so… enjoy the moment. You’ll be amazed at how fulfilling it is to help someone else. When you’re able, give a helping hand. Ask a friend how they are going, smile, or buy the person behind you a cup of coffee. When you focus on authenticity and integrity, you know that all your actions are for the best and can remain at rest knowing you have played your part. When we try new things, we always risk the possibility of failure. Yet if we never fail, we will never change. Be brave enough to try new things and expand your horizons. Have people around who invest in you and inspire you to be better. When we have life giving relationships, we are nourished and are far happier. Make the decision to turn your goals into habits. Start small, and work habits like healthy eating, exercise, spending more time with family or practicing Mindfulness into your schedule a few days a week. As you grow in confidence, implement more habits and reward yourself for your victories! Life can be difficult, and we all go through seasons that seem to have no end. In these times, decide to push on. Believe that these moments will pass and keep going. The hurts of the past and worries of the future will drag you down. Begin to recognise these unnecessary weights and begin healing from them. Speak about them to a friend or see a counsellor and experience healing. Look at this infographic by Calm Down Now for more details on the Keys to Happiness. Do you want to unlock the keys to happiness? Are you looking for a way to turn survival into a life that thrives? Then here’s what you need to do: contact Colleen on 0434 337 245 for a FREE 10-minute phone consultation on how she can best help you, or press book now to book on the online diary.